Alexander McQueen was the undisputed bad boy king of fashion during his lifetime, and even now the line's designs retain his sophisticated DIY aesthetic. 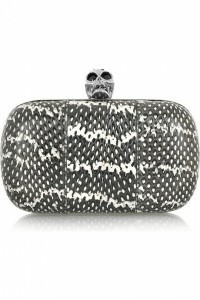 McQueen's line of skull clutches are legendary, but they each have their own quirks and particularities that make them unique. This snakeskin clutch uses the extraordinary patten of the water snake in a sophisticated way. The naturally striking black and white pattern is more nuanced than anything a machine could make, and the way the strips have been arranged is genius. Instead of matching up the pattern, McQueen has created a patchwork-style design, which adds a lot of texture and depth to the clutch. The water snake skin is really the bag's only accent besides the skull clasp, which is embellished with black crystal eyes. The cool tones of the clutch combine with the silver clasp to make an edgy, rock 'n' roll design. But you don't have to be an actual rock star to carry this bag. It's chic design is evening-wear ready. At $1,650, this skull clutch isn't cheap. But since McQueen's death, his designs have become instant collector's items, so it's a worthwhile investment for those who can afford it. Besides, I can't resist this level of punk chic at any price.